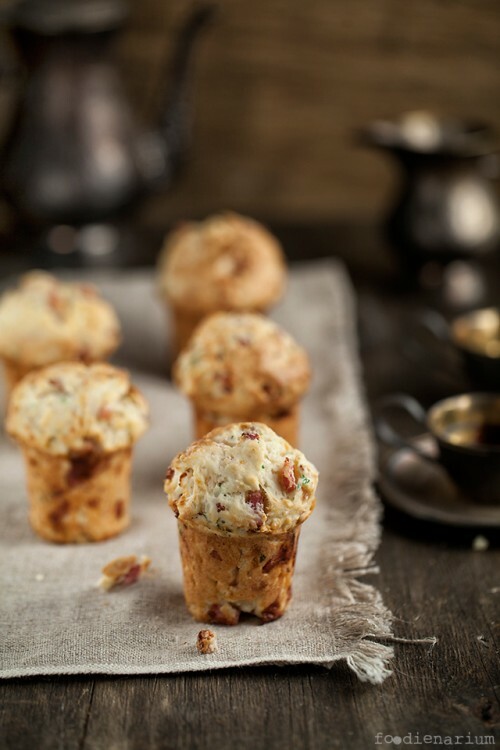 If you feel neutral about pastry, then perhaps these muffins is what you need. Their composition can be varied by adding different vegetables, such as bell peppers and using bacon instead of ham, salami, hunter sausages, etc. I think that they are ideal for a hearty breakfast, plus you can leave them to have a bite in the afternoon. Warm the oven up to 180C (360F) degrees. Separately mix all dry and all liquid ingredients except the bacon, garlic and cheese. Add the dry mixture into the liquid in portions, gently stirring (can be done in a stationary mixer, but slowly). In the end add chopped bacon, rated cheese and squeeze the garlic. Gently stir. Spread the dough in the muffin pans (we have a usual pan from IKEA) and bake for about 15-20 minutes.